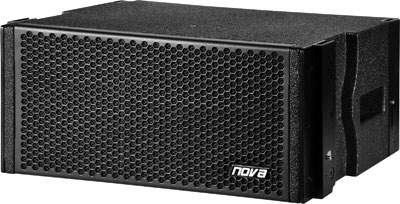 The ELC26 is a horn-loaded dual 6.5 "/ 1" high-performance line array module. With a height of 21 cm only, the ELC26 is ultra-compact. This provides a very tight coupling of the single components, which ensures a uniform vertical dispersion. The speaker components are specially developed for the ELC26. They allow an extremely high load capacity and thus a maximum sound pressure of 130dB (80 Hz-20 KHz). Up to 16 units can be flown a one line, which covers events of 8,000 people or more and providing an outstanding performance. The ELC26 is a two-way high performance line array speaker in a trapezoidal chassis for fixed installations and mobile use. The cabinet is equipped with one 1" HF driver (1.75” voice coil), which is mounted onto the waveguide. The nominal coverage is 100° x 12° (H x V). The MF/LF section is equipped with two high-performance 6.5" speaker (2” voice coils), which are hornloaded. The 6.5” transducers are contructed behind the horn of the high-frequency section (coaxial construction). The ELC26 can be flown by using the EC1 flyframe. The ELC26 is compatible with almost all other ELITE models including ELITE subwoofers. The ELC26 can be stacked onto the E18SUB subwoofer by using the ESA1 adapter frame (option). The chassis is constructed from 15 mm plywood (birch) and covered with black PolyCoat© finish. The cabinet is equipped with two grip handles and one front grill with transparent charcoal foam backing. Two speakon connectors (NL4) are mounted at the rear side of the chassis for signal input (input) and signal link (link).The power rating of the ELC26 is 500 W (RMS), the impedance is 16 ohms.